This is a novel from 1960 about the railway workers’ strike on the Niger-Dakar railway 13 years earlier. When I said in my Read The World challenge status update that I’d read 16½ books this year, this was the half book; it has taken me rather a long time to finish. Mainly I think that’s because it is written in rather a high style. Elaborate descriptions, speechifying and a general tone of Serious Business. I’m always wary of commenting on prose style for books read in translation, but it reads like a conscious attempt to present the strike as an epic struggle — which indeed it is, featuring a large cast of characters in a many month confrontation with the company and the colonial power, involving a riot, speeches, a trial, a protest march, police brutality, starvation, trickery, and murder, all in a serious cause which is at its root the assertion of the human dignity of the African workers. So the style is not inappropriate; but it’s not particularly to my taste. Still, it’s an interesting and impressive novel, even if I wasn’t always grabbed by it. Perhaps i’ve just read too much post-colonial fiction recently. There are certainly lots of good things about it; it’s often vivid and atmospheric, for a start. I liked the prominence of female characters who are not just defined by their relationships to men, but take an active role in the strike. I think it probably deserves a more enthusiastic response than I’m giving it; but hey-ho. Sembène was also a film director, and while trying to sort out what his name was (the edition I read had ‘Sembène Ousmane’ but everywhere else seems to use Ousmane Sembène’) I found there was a book of interviews with him about film, which might have made a more interesting choice for Senegal for the Read The World challenge. Or not, of course. 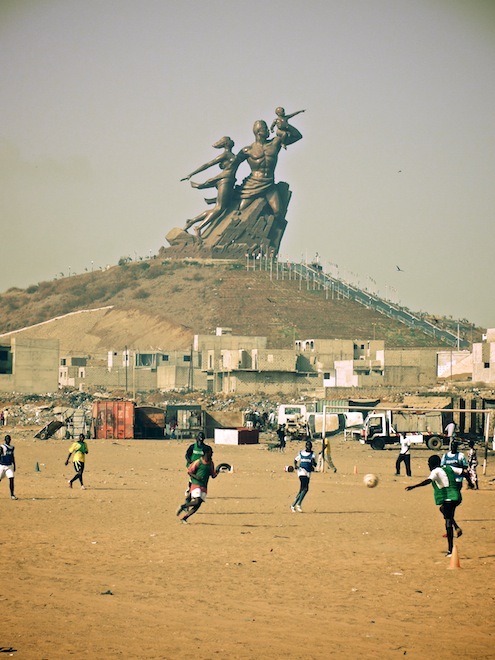 » The photo is of people playing football in front of the African Renaissance Monument in Dakar; it’s © Jeff Attaway and used under a CC attribution licence.